Please compare the newspaper notices of her death with this obituary provided by Billy Murl Phillips (aka Bill Dalton Phillips). The inspiration for this fraud could be the Kingfisher Free Press of Jan. 29, 1925, though it has obviously been altered to add the necessary "proof" that Bea Elizabeth Phillips was her daughter (the listing of family that died before her, including Elizabeth, has been added). Mrs. Adeline Younger Dalton, Age 89 Years. 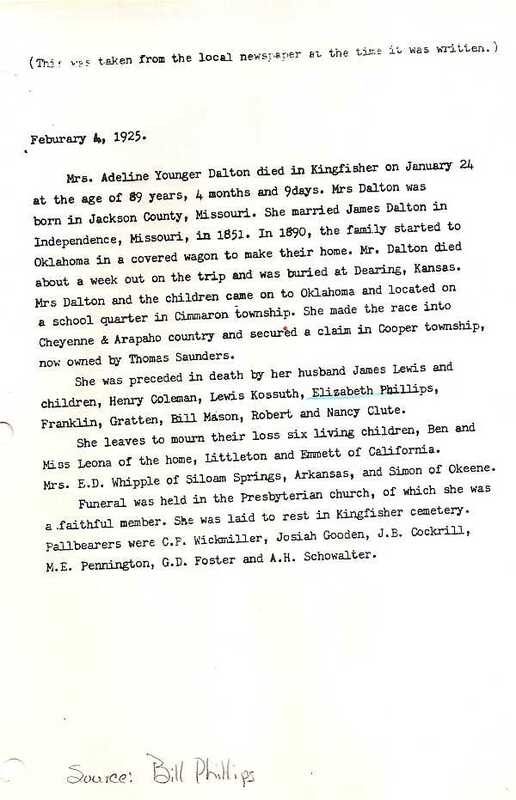 Mrs. Adeline Younger Dalton died in Kingfisher, Oklahoma, January 24, 1925, at the age of 89 years, 4 months, 9 days. Mrs. Dalton was born in Jackson County, Missouri in 1836. She married James Dalton in Independence, Missouri, March 12, 1851. The family started to Oklahoma by covered wagon to make their home. Mr. Dalton died about a week out on the trip and was buried in Robbins Cemetery at Dearing, Kansas. Mrs. Dalton and the children came on to Oklahoma and located on a school quarter section in Cimmaron (sic Cimarron) Township. She made the race into Cheyenne and Arapaho Country and secured a claim in Cooper Township, now owned by Thomas Saunders. She was preceeded (sic) in death by her husband, James Dalton, and children, Coleman, Lewis, Elizabeth Phillips Franklin, Gratten, Bill, Robert, and Nancy Dalton Clute. She leaves to mourn their loss, six living children: Ben and Miss Leona Dalton of the home, Littleton and Emmett of California, Mrs. Eva D. Whipple of Siloam Springs, Arkansas and Simon of Akeene. The funeral was held in the Presbyterian Church of which she was a faithful member. She was laid to rest in Kingfisher Cemetery. Pallbearers were C.P. Wickmiller, Josiah Gooden, J.B. Cockrill, M.E. Pennington, G.D. Foster and A.H. Schowalter. There is no source given for this obituary. See the Kingfisher Free Press obituary to see a possible source for this fraudulent transcription. Philip Steele wrote "Adeline's obituary at the time of her death list all children. No Bea Elizabeth listed." 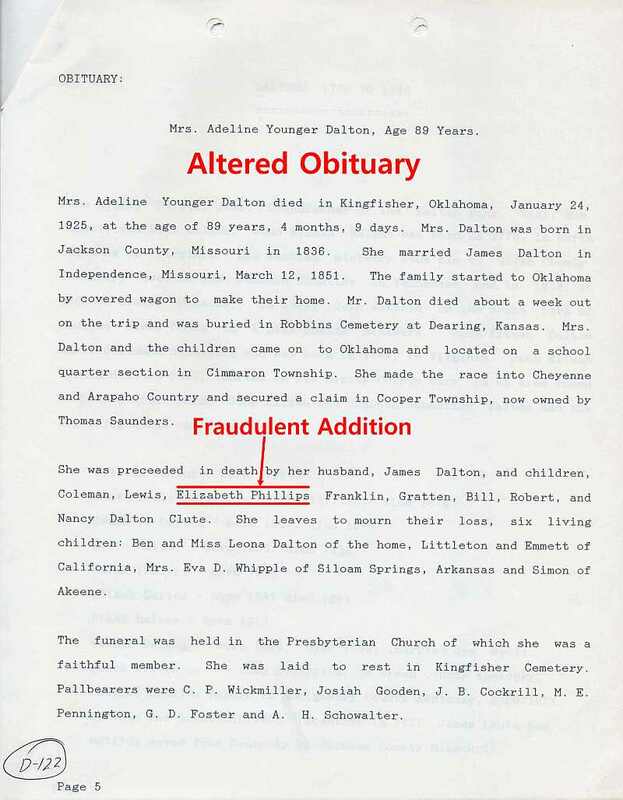 I have a copy of the newspaper clipping on the obituary of Adaline Dalton taken from the library in Bartlesville, OK and no mention of her ever having a daughter named Bea or Elizabeth. The Bartlesville Daily Enterprise obituary of January 26 can seen here (page 1). It's not known which version was first. Note the sentence at the top – there is no name of the paper or date of publication. In this version, the living and the dead descendants are listed in separate paragraphs. Differences between this and the version above are highlighted in red. Mrs. Adeline Younger Dalton died in Kingfisher (Oklahoma is omitted) January 24 (1925 is omitted), at the age of 89 years, 4 months, 9days. Mrs. Dalton was born in Jackson County, Missouri (in 1836 is omitted). She married James Dalton in Independence, Missouri (March 12 is omitted) 1851. In 1890, the family started to Oklahoma in a (above reads by) covered wagon to make their home. Mr. Dalton died about a week out on the trip and was buried in (Robbins Cemetery at is omitted) Dearing, Kansas. Mrs. Dalton and the children came on to Oklahoma and located on a school quarter section in Cimmaron (sic Cimarron) township. She made the race into Cheyenne & Arapaho country and secured a claim in Cooper Township, now owned by Thomas Saunders. She was preceded (misspelled above) in death by her husband, James Lewis (Dalton, is omitted) and children, Henry Coleman, Lewis Kossuth, Elizabeth Phillips, Franklin, Gratten, Bill Mason, Robert and Nancy (Dalton is omitted) Clute. She leaves to mourn their loss six living children: Ben and Miss Leona (Dalton is omitted) of the home, Littleton and Emmett of California, Mrs. E.D. (above reads Eva D.) Whipple of Siloam Springs, Arkansas and Simon of Okeene (above spelled Akeene).